Cześć! While “hello” may be the only Polish word I’ve learned so far during my time at the COP24 in Katowice, the conference has been nothing short of academically stimulating. Day 3 of the conference was filled with events covering my primary interests: the intersection of climate change, food systems, and health. I started off my day in the press conference room, in which organizations deliver brief 30-minute press briefings and Q&A sessions. I attended three back to back thirty-minute press briefings this day. The first press briefing was lead by the World Resource Institute which has just released a report entitled “Creating a Sustainable Food Future.” The report answers the question of how the world can adequately and sustainably feed nearly 10 billion people by 2050 by proposing a “menu” for a sustainable food future. World Resource Institute's menu for a sustainable food future. The second press briefing was delivered entirely in Spanish by indigenous women who are environmental activists in Peru. Their key message was that women are strong, independent, and have the leadership capability to take control of the fight for nature conservation and preservation. 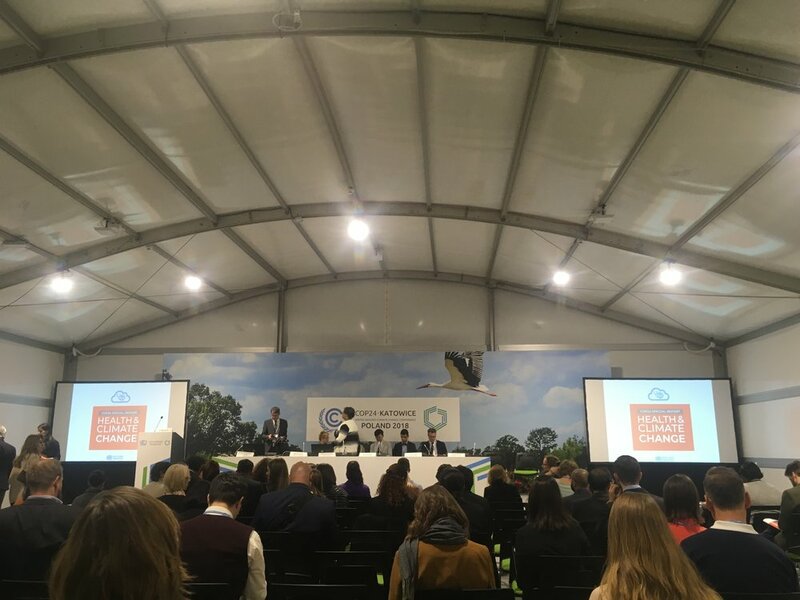 I had been anxiously awaiting the third press briefing (and subsequent event) since entering the conference, as they were the first side events addressing the effects of climate change on global health. The World Health Organization (WHO) released a special report for the COP24 providing 7 recommendations to address climate change and public health, emphasizing that this report was delivered on behalf of the global public health community. Health professionals are considered to be the most trusted professionals in the world, and are therefore the best advocates for stronger climate action. One key takeaway from their report was that the health benefits resulting from climate change mitigation efforts would give the world double their return on investment. Air pollution is currently the biggest environmental health risk, causing 7 million premature deaths every year. Efforts to address air pollution would reduce the prevalence and resulting economic burden of illness like lung disease, heart attacks, strokes, and asthma due to the reduced medical attention required. The messages in this report are of the utmost importance for parties involved in the negotiations, considering the right to health is clearly outlined in the Paris Agreement. Young activists at the COP24. Although I did attend sessions on both food systems and health today, I was disappointed that the two topics were not more closely linked in the presentations. Neither the World Resource Institute or the World Health Organization directly mentioned the importance of shifting dietary habits in achieving their goals. Reducing animal product consumption, especially beef, has both environmental and public health benefits. Animal agriculture puts a heavy strain on the earth’s finite land, water, and energy resources. At the same time, high animal product consumption has been associated with increased risk of diet-related health complications like obesity, high cholesterol, heart disease, and stroke. Widespread efforts to shift towards a more plant based diet would help mitigate climate change and reduce the prevalence (and therefore, financial burden) of these diseases. This is one avenue that would further the goals of both the World Research Institute and the World Health Organization. The World Health Organization presenting on their Health & Climate Change special report. After the press briefings and health focused events had concluded, I went to a youth training workshop on constructive journalism. This event was lead by two documentary filmmakers from the US and allowed attendees to engage with other youth in discussions about how climate change is portrayed in the media. It was interesting to compare perspectives with others from across the world, and the workshop was a welcome break from the standard panel followed by Q&A session structure. My final event of the day was a panel featuring speakers from the US, Israel, and Chile discussing climate change adaptation strategies. Once we were all COPped out, the other members of the Tufts delegation and I got together and went to a traditional Polish restaurant in Katowice before calling it a night. 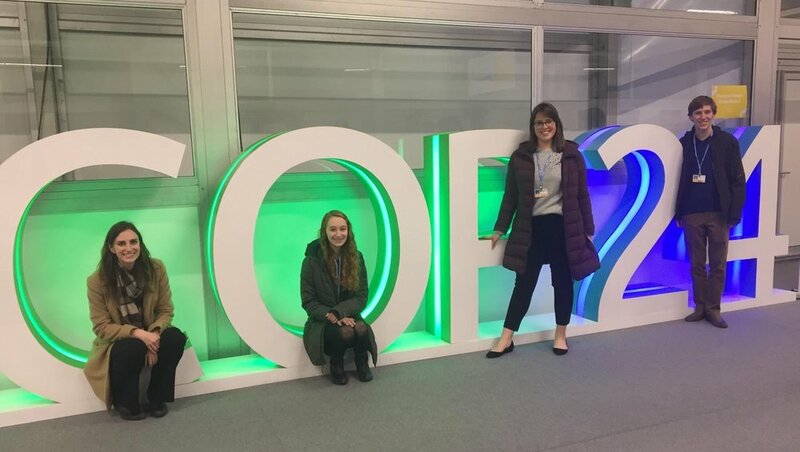 The Tufts University delegation at the COP24.